Daily Illuminator: Coming Soon To Discriminating Warehouses Everywhere . . .
March 27, 2013: Coming Soon To Discriminating Warehouses Everywhere . 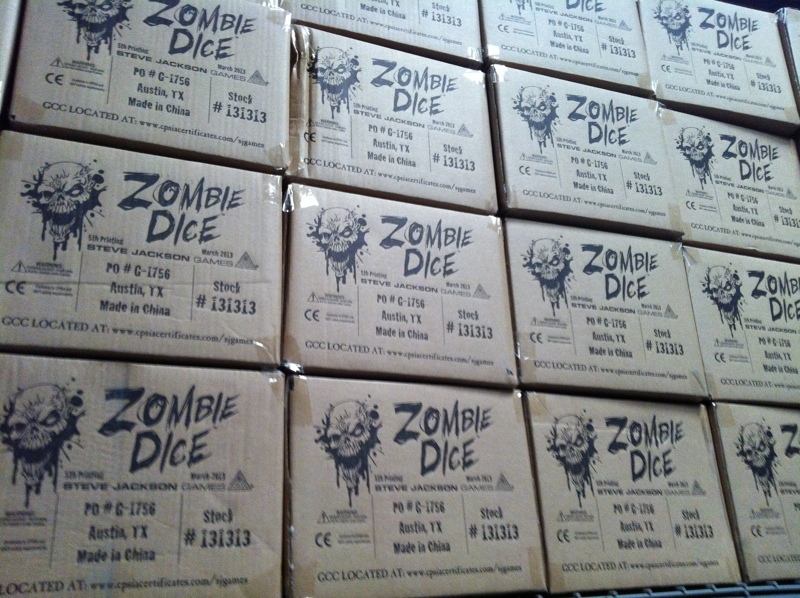 . .
Meet our new Zombie Dice shipping cartons. Note the festive addition of blood splatter and a decaying head to what would otherwise be a drab and uninteresting cardboard box. Now as lovely as they may be, we didn't do this just to liven up warehouses with the rotting visages of the living dead. It's really just to make our cartons easier to spot at a distance. And that helps us make sure the games you want end up where they're supposed to: your FLGS! All of our games will be undergoing a similar makeover as new printings ship. Sorry, Munchkin fans, but we're afraid there won't be any special in-game bonuses for keeping one of these boxes on hand.